Near death from a mysterious contagion, O'Neill had agreed to be implanted with a Tok'ra symbiote. However, the Tok'ra, Kanan, travels to the secret outpost of the System Lord Ba'al, where he is captured, and flees the body as O'Neill dies. O'Neill awakens in a sarcophagus with no memory of events since the implantation. He is a prisoner of Ba'al, held in his secret outpost which uses anti-gravity chambers as prison cells and a means of torture. 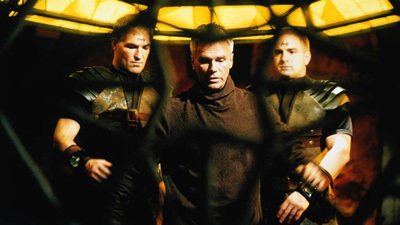 Ba'al demands to know the reason for O'Neill's mission, and when O'Neill is unable to answer, he is tortured to death and revived again in the sarcophagus. At the SGC, the team realizes that Kanan had used Ba'al's slave, Shallan, as an informant and had fallen in love with her. Blending with O'Neill had awakened a sense of duty in Kanan not to leave her behind. As O'Neill endures repeated torture, Daniel appears to him in his prison cell. Daniel warns that the cycle of torture and resurrection will continue until O'Neill loses his own identity. As an ascended being, Daniel cannot intervene, but he offers O'Neill an escape through ascension. O'Neill refuses ascension as an option, but he asks Daniel to use his power to make his next death the last. Ba'al's stronghold is too heavily fortified for an attack from SG-1, but in a moment of enlightenment, Teal'c suggests informing Lord Yu of Ba'al's secret outpost, certain that the Goa'uld will attack. O'Neill has begun to remember Shallan, and fearing that he no longer has the strength to withstand the torture to protect her, he begs Daniel one last time to let him die. Daniel promises that his ordeal is almost over, and as Yu's forces attack, O'Neill has an opportunity to break free and escape. As O'Neill recovers at the SGC, Daniel appears to him once more to promise that everything will be alright. Kanan’s last mission was as an operative aboard Zipacna’s fleet. He managed to escape during a battle with Lord Yu’s forces. Kanan had worked undercover as a minor Goa’uld in Ba’al’s service several months ago. Ba’al had kept the existence of his secret heavily fortified outpost hidden from the other System Lords. The outpost was a secret test facility for weapons technology and gravity field generators. Over a period of several months, Kanan was able to map out the entire facility using Ba’al’s lo'taur for access. Presumably Ba’al’s outpost was destroyed by Yu’s attack from the air. The fate of Ba’al is unknown. Daniel is energy now. He has the power to change things, but is not permitted to interfere. Ascension doesn’t make you all knowing. While a mature symbiote can take control of the host body whenever it wants to, it doesn’t work both ways. It is possible for a symbiote to block all sharing and take complete control of a host, as in the case of Kanan. Article Nine of the Earth-Tok’ra treaty provides for the sharing of information and mission reports. Tal’vak acid is capable of slowly burning all the way through a body. Though it cauterizes the flesh as it burns, a very small amount often finds its way into the blood and begins to spread. Shallan will stay with the Tok’ra and continue to fight in Kanan’s name.